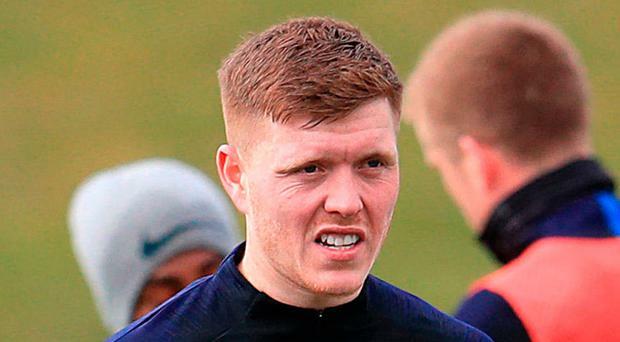 Alfie Mawson accepts he may not be a household name among England fans but the Swansea defender is ready to prove he belongs in a Three Lions shirt. The 24-year-old is one of four uncapped players in Gareth Southgate's latest squad, joining Bournemouth midfielder Lewis Cook and Burnley pair James Tarkowski and Nick Pope as England prepare to face Holland and Italy over the next week. The centre-half may have spent the best part of two seasons in the word's most watched league and scored the winning goal against Jurgen Klopp's star-studded Liverpool side just two months ago but remains admirably grounded despite his elevation to the international fold. Mawson, a surprising selection ahead of more decorated figures like Gary Cahill and Chris Smalling, believes some supporters may not be familiar with him and would forgive those who are for being sceptical. "A lot of people wouldn't even have heard of my name until this call-up and a lot of people are probably thinking 'how on earth has he got a call-up'," he said. "It's humbling to be here. It's all come so quick, I never thought four of five years ago I'd be called up for the senior team. I used to say things like this don't happen to people like myself but clearly they can. "I'm very proud to be an English footballer. To possibly pull on a full England shirt and bellow out the national anthem, I'd love it." Mawson's excitement at being around the squad so close to the World Cup is tangible in every word but it should not be mistaken for wide-eyed naivety. There is a seam of ambition present as well and a determination to use the coming days as a platform to prove himself. Those qualities were there when he rose to captain Barnsley at the age of 21 and they linger still. "I don't want come in and be someone who they look at and think 'he's a young lad, out of his depth'. "I'm 24 now, for me that's not such a youngster anymore. John Stones (23), Eric Dier (24), these players have been here for years. Why can't I try to mould myself into something like that? "You don't want to step on anyone's toes, be too loud or too assertive, especially when I haven't got a cap, but in training it comes out. In my position you have to talk, you have to be a voice and be a leader regardless." Mawson also had a word of thanks for Swansea manager Carlos Carvalhal, who has lifted spirits - and survival prospects - since arriving in December. "Since the manager came in there's been a real uplift, a real resurgence," he said. "He's given us a little more freedom to grow and play the Swansea way, we're really trying to bring that back."